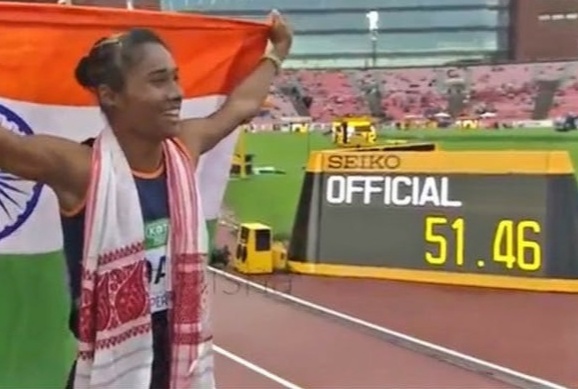 Golden Girl Hima Das created history by becoming the first Indian Athlete to win 400m at IAAF 2018. Gold - 2018 400 m IAAF World U20 Championships. Ecstatic at her win, she said “I want to thank all Indians who came out to cheer and all Indians back home. Also, thank the AFI, SAI, coaches, parents, and family for their unconditional support over the years”. Athletics Federation of India President Adille Sumariwalla said, "Very proud of Hima for creating history. It is one of the proudest moments of my life and for Indian athletics. Congratulations to Hima and her coaches, the government and SAI for their support to AFI." What was the Game Plan ?. The Historic Race to the Gold .....Nipon Das her coach and Hima had a strategic game plan. Hima would keep pace with the others till the 300-meter curve and then suddenly increase the speed at the last 80 meters. 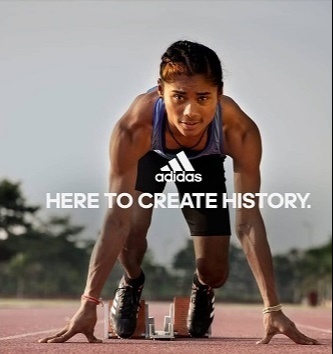 Executing plans is never easy but Hima Das did it beautifully. The others were running out of steam; Hima, as planned, picked up her speed at the last 80 meters. The burst started at the 39-second mark in a 52 sec race, where she overtook three of the contenders. Calm, composed and collective, Hima had her focus completely on her race. She saw the finishing line so close and knew she had a great chance to create history and cleared the tape with a sensational 51.46 seconds; leaving the silver medallist Romanian at least a couple of meters behind. 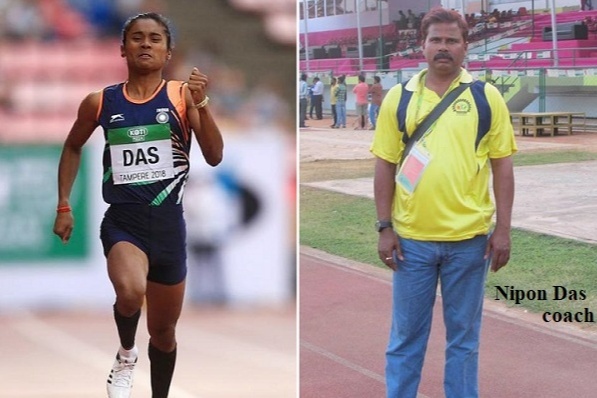 Her coach Nipon Das said that he was not one bit worried as he was confident that she would execute the planned strategy – her race begins at last 80 meters. What an emotional, thrilling and a spectacular moment it was for all Indians. Hima Das is one of the four children of a Rice farmer Ronjit Das and Jonali Das from Nagaon village in Assam. Her staple diet was Dhal and Rice and no supplement bars or fancy protein or health drinks. Grew up playing football in the muddy fields and was seriously contemplating a career in football. At school and local events she would win all the races handsomely. Maybe never thought nor did have the opportunity to try out athletics. At an inter-district meet when she grabbed prizes for 100, 200 and 400 meters without any training at all, she neither had fancy shoes nor had even heard of spikes or starting blocks. Nipon Das admits that he has been around as a coach for many years, but never spotted a talent like this. He keenly observed her smooth strides, her agile action, her natural flair for running, her stamina and the way she effortlessly sprinted. All she needed was regular rigorous training schedule, techniques, guidance and mentoring which Nipon Das has been providing and the results speak for itself. Due to lack of facilities in the village, Nipon asked her to move immediately to the base camp in Guwahati. Her accommodation, coaching and every other facility were provided and he took her under his wings. Athletes start when they are 7 or eight but Hima started only at 16. She wore her first pair of spikes only when she was 16+ and obviously had never known of starting blocks or diets etc., All she knew was to simply obey her Coach and sincerely work out. Almost 6 to 7 hours of training each day consisted of long distance, sprints, beach and mountain running, bodybuilding etc., A strong determined girl had only one thing on her mind - Run the race and don’t care about or get nervous about other participants. She quips “It is not by choice but by chance that Nipon Sir picked her up” and she is ever so grateful to him. Its only been 18 months since she has taken to the tracks and look what she has achieved. She has been on the national scene winning races in the 400 and the relays 400x4 and her quick rise has surprised many. She was part of the 4 x 400 meters Indian relay team at the CWG and qualified for the 400 meters finals. Das is now part of a group of Indian athletes who have won medals at the World U20 Championships, which includes Seema Punia (Bronze, Discus throw), Navjeet Kaur Dhillon (Bronze, Discus throw) and Neeraj Chopra(Gold, Javelin throw). Hima is been away from home for a long time and now simply wants to spend time with her parents, siblings, and friends. Soon will be back on the practise session. Olympics is the ultimate goal for every sportsperson and Hima will have to start preparations in all earnestness. She has a humongous task ahead to run under 50 seconds but she has the whole country backing her and with such determination she is sure to book a place on the podium at the 2020 Olymlpics. Jakarta Games is on her mind right now.